JUMBLE SALE: Tomorrow, Saturday, 2pm to 4pm. Berwick Community Association are holding a jumble sale at Berwick Village Hall on Saturday 9th February. Jumble, bric-a-brac, hidden treasures, tea, coffee and cake. Please bring any jumble or bric-a-brac to the hall 10am on the day or ring Diane on 07920793096 for collection to suit. CHURCH SERVICES: Sunday, Holy Communion BCP 8am at Alciston; Holy Communion 9.15am at Upper Dicker; Holy Communion 9.30am at Arlington; Holy Communion 9.30am at Selmeston; Holy Communion 11am at Berwick; Holy Communion 11am at Wilmington. LUNCH CLUB: Cuckmere Valley Lunch Club meet on Tuesday, 12.45pm in Alciston and Selmeston Village Hall. To book please call 01323 870072 or 871299. VALUATIONS: Eastbourne Auctions Valuation Team will be at Kube Hair Salon on Wednesday, Langney Shopping Centre, Eastbourne, 10am to 2pm for free valuations. 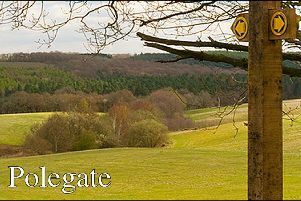 WI: Firle and Beddingham WI meet on Wednesday, The Great Food Debate. 7.30pm in Firle Memorial Hall. GARAGE SALE: February 13 to 15, The Dower House, Michelham Priory Road, Upper Dicker 8.30am to noon and 2pm to 5.30pm, in aid of St Wilfrid’s Hospice. Furniture, household goods, linen, bric-a-brac, clothes, craft items, fabric, books etc. BUSINESS NETWORK: Cuckmere Rural Business Network Meeting on Tuesday February 19, 6.30pm at Berwick Inn (opposite Berwick Railway Station). To book your free place please call Josie 01323 840048 E: josie@hailshamcreative.com. AIR AMBULANCE: Kent, Surrey and Sussex Air Ambulance. Book a free talk about their life-saving work. Would you like one of the volunteer speakers to visit? If you are a member of a local group, club or society, then you can book a talk, free of charge. The volunteer will talk about how the Air Ambulance Service work, innovate and save lives. It promises to be an interesting and inspiring meeting for your members, whilst enabling the service to raise vital awareness for their charity. If you would like to hear more, they would love to hear from you. Get in touch now to book a talk at a time and place that suits you. Tel: 01634 471900, talks@aakss.org.uk. Please note that the presentation is only suitable for audience members over the age of 16.